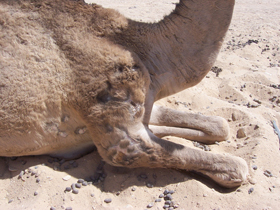 Camels are falling prey to many ailments due to a scarcity of plant material and water. They play a vital role in nomadic life, travelling long distances transporting people and provisions, this amazing animal also provides wool from which Bedouin women weave tents in which to live in with their families. 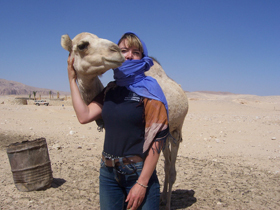 With very little vet care available to the tribes I hope to cultivate plants that camels can forage as a food source and help keep them in good maintenance and share with Bedouin tribes how they can protect their traditional culture. It was a I can appreciate and learn from their traditional wisdom and the remarkable relationship between the environment and the human spirit. The Muzeina tribe were fascinated how the camels self selected specific plant material to self medicate themselves. The camel in the picture had fallen down the mountain and broken his right shoulder six months ago. It has not been treated and there is no vet for some 500 miles. Camels are so sacred to the tribe they will not intervene and wait for Allah to decide their fate. As there is no predator to a camel this can be a long process. I was allowed to treat this camel and you will see it is self selecting my devil’s claw which is a root of a plant famed for it’s analgesic and anti inflammatory properties. The camel responded well to my other herbs and a topical lotion made of wintergreen, (from the willow tree which makes Asprin) aloe vera and yarrow. 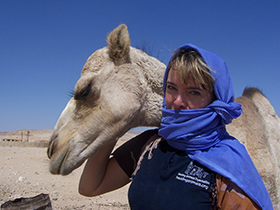 I felt an enormous amount of responsibility as I was being judged on my ability to help their camels; thankfully the tribe have asked me back as they felt their camels had benefited from the treatments. Amazingly I met Dr Ackmed a revered herbal medicine man on Mount Sinai who appeared with Kate Humble on episode three of the Frankincense Trail aired on BBC2 the other week. In the picture he is giving me a 300 year old pestle and mortar as a gift for my work with the tribe’s camels. I gave him and the sheiks gifts of woven horse hair braided with beads. Wow, Iris, Betty and Dancer kindly allowed me to use their own hair for the occasion. Dr Ackmed commented that he thought Allah had sent Wow to me. He sure did! Climate change has reduced the rainfall in the Sinai desert to such an extent over the last 7 years that orchard gardens in the mountains are dying through lack of water and wells are drying up fast. 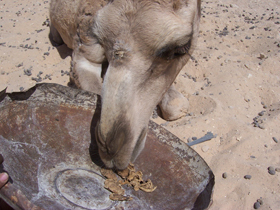 As the water table had dropped dramatically many Bedouin are keen to look at new ways to sustain themselves and their animals. A small working group from Leeds Metropolitan University is involved with the Nawamis community project to build a Bedouin School, and a community well. Also my students and I will be returning to Sinai to continue our healing work in 2010. 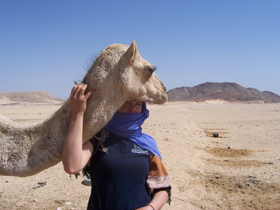 I prepared for this trip by working with a camel called Mohamed who is based at Glyndebourne. He lives with 500 alpacas on the estate and the gamekeeper is enthralled with the vegetation he self selects and browses. Mohammed is a Bactrian camel originally from Mongolia. Unlike horses and cattle which graze plants and grass down to the roots, camels are economical feeders that never overgraze the vegetation. They keep on moving while feeding. No matter how rich or how poor the quality of the vegetation, camels take only a few bites from any one plant before moving to another and camels actually conserve the desert vegetation. Legends have been born in this landscape and it is the home of prophets and three major world religions. I am thrilled to be helping out and giving something back. Serving beyond the self and learning more about the spiritual values of other cultures and how we can embrace a greater understanding of each other and our animals.